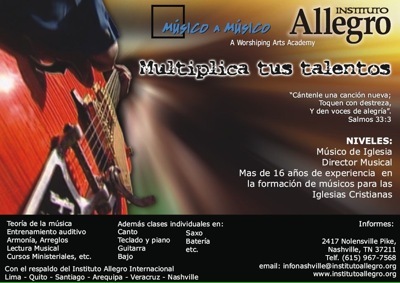 Nashville-based Musico a Musico, which conducts musician training for Spanish-speaking Christians around the world, will be starting a Spanish-language Worshiping Arts Academy in Nashville in conjunction with the Allegro Institute. The registration started for the Allegro Institute in Nashville, TN, the classes are Schedule to start Saturday July 12. There are many already signed up, and many interested and planning on registering. In Nashville, Allegro Institute will start this with a very important partnership with Músico a Músico in the city of Nashville. MaM is a ministry dedicated to have Congresos of praise, worship, and arts in different cities in the Latin world. The Allegro Institute is joining efforts with MaM to start this program in Nashville. We believe that this union and the classes from Allegro Institute/Músico a Músico in the city of Nashville, TN will be the beginning of a long project for both institutions. The Director of Instituto Allegro/Músico a Músico in Nashville is Rachel Vasquez who has been working hard to have every detail ready for the start of the classes.